I’m only posting two photographs from our vacation. The collapse of the bridge in Minneapolis and subsequent reporting on the state of our infrastructure got me thinking about the thousands of dams all over this country. Of course I'm worried about bridges, especially some specific Chicago bridges, but I can't get rivers and dams off my mind. There are so many out West! We didn’t make it to Hoover Dam on our journey, but we did drive by the Flaming Gorge Dam in Utah, seen in the top photo, below. (That's not water flowing, there; it's sunlight on concrete. Behind the dam is a reservoir extending for miles.) 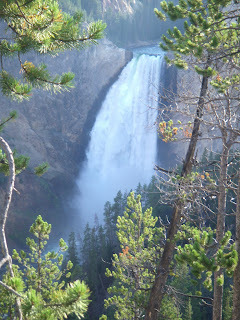 For perspective’s sake, it’s 500 feet high, quite a bit higher than Yellowstone’s Lower Falls (302 ft.), captured in the bottom photo. 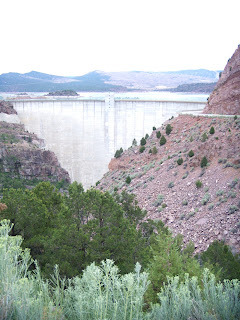 Because of our road trip, I can kind of imagine what would happen if a dam like Flaming Gorge was compromised. But to torment myself further, I Googled that 2005 report card so much in the news this last week. Here are the grades: “D” for dams.